The challenge: Build a shelter that will keep one person alive in a particular climate. Excited year 4-6 girls entered the forest area of the playground to participate in a forest school session, led by two teachers from Downe House. The girls were divided into four groups and each given a bar line graph. Each group set to work on interpreting their graphs, they needed to work out what the lowest temperature was and how much rain that area experienced. Climates ranged from the Artic all the way to the desert. If at first you don’t succeed try and try again and that’s exactly what the girls did. One group even made their shelter three times before deciding on their final one. The girls thought carefully about how their shelter would keep the rain out, how it would keep them warm or how to remain cool in the heat. The four groups, made up of girls from different age groups, worked extremely well together and demonstrated excellent team work skills. Each of the team members contributed to their shelter. The final task was to choose appropriate clothing for their climate. Different types of coats, hats and trousers were put on by the youngest member of the team. Each team explained to the rest of the group why they built the shelter the way they did and what clothes they had chosen. 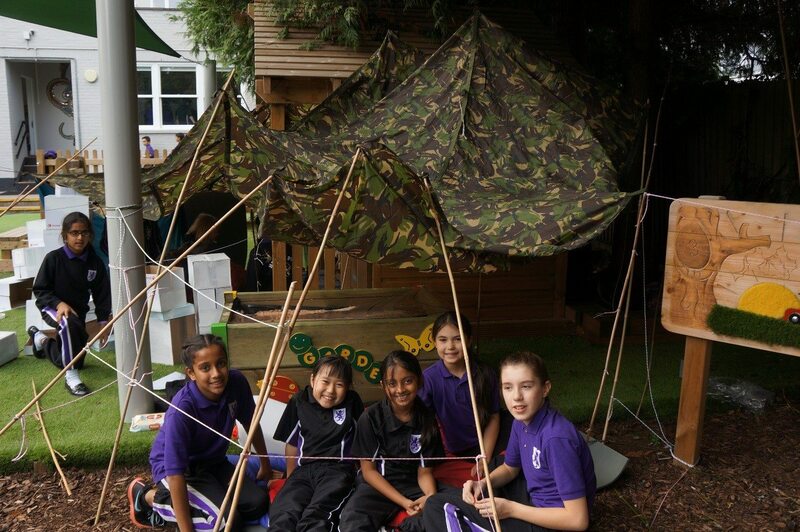 The girls were then shown what shelters are normally built in those climates and compared them to their own. The girls were so pleased with their efforts and excited by all the new skills they had learnt. As you can see the girls loved their experience and immediately started planning their next shelter.